In the winter, there are days we get stuck on our hilltop. With the Internet working and the pantry stocked, we are fully operational but cabin fever hits easily. Once, after three days, my husband and I decided to hike to the post office to get our mail. Halfway, he wisely turned around with our dog. He did not want to risk an injury on the icy roads, and the poor skinny dog was shaking terribly from the cold (Vizslas don’t have undercoats). I moved on and walked the four miles to the post office and back. Until that day, I had no idea what shin splints are. The next day, I knew. Winter can be dreadful but then comes summer, and all is forgotten. Every year it hits me again how beautiful this area is. I have biked and driven on those country roads a thousand times, yet every year I find it breathtakingly beautiful: the rolling hills where farm fields alternate with wooded areas, the many small creeks, the tidy farms with their red barns and corn storage bins, and happy cows. Sure, I moan and groan like everybody else when the temperature reaches 95 degrees and it is so humid that you have to store bread in the fridge so it doesn’t mold. And then all those itchy bumps from insect bites… I get stung even through clothing. This year is particularly bad, maybe because the winter was so mild. I remember sitting in a sub-zero air-conditioned office in New York City on a hot summer day and dreaming of being in the country. Now I am in the country, and I am fully enjoying it – despite the bugs. During strawberry season, I tossed all the not-so-pretty strawberries from the garden in the freezer for jam. After making jam last week I had some leftover strawberries so I made a variation of my Berry Frozen Yogurt. I like cooking the strawberry puree first – it gives the frozen yogurt more flavor, and the strawberry puree keeps longer if you don’t use it right away. But you can also use the raw puree and add the whole amount of sugar at once. 1. Put the strawberry puree in a small saucepan with ½ cup sugar. Bring to a quick boil while stirring to dissolve the sugar. Remove from the heat and let cool. Chill thoroughly. 2. In a bowl mix the chilled strawberry puree with all remaining ingredients well with a wire whisk until the sugar dissolves. 3. 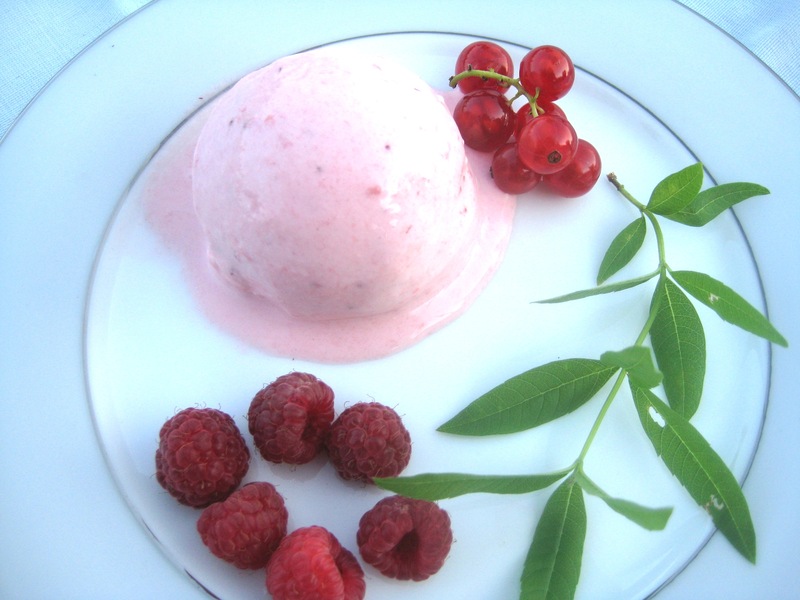 Process the frozen yogurt in an ice-cream maker according to manufacturer’s instructions. 4. Fill frozen yogurt in plastic containers with tight lids and place in the freezer until solidly frozen. To soften, remove from the freezer 5 to 10 minutes before serving. Strawberries, still? Lucky you, enjoy!